BT in the news again today – they won’t be hitting their target of kitting out 12 exchanges with its new fibre network by the end of this year as originally hoped. The company’s broadband programme director Johnny McQuoid admitted to The Register in May this year that BT had been forced to delay the rollout of its fibre-to-the-premises (FTTP) technology, after roughly a quarter of its trials found engineers taking two days to blow cables into customers’ homes. He said at the time that some of the trials involving around 1,000 properties were taking twice as long as anticipated due to duct blockages that needed to be cleared. Originally BT had planned to have 12 exchanges fully prepped for the telco’s fibre optic network by September. That rollout was delayed to the end of 2011. Now, the firm has revised those plans again by confirming that only six exchanges will be kitted out within that timeframe. The company said that Ashford in Middlesex, Bradwell Abbey in Milton Keynes, Highams Park in North London, Chester South, St Austell and York would all get FTTP exchanges before the year was out. “We don’t expect to roll out to the 12 exchanges by the end of the year, but we fully expect to exceed that number in due course – we will announce these during our regular quarterly roll out updates,” the BT spokesman confirmed. The UK’s largest telecoms outfit also announced yesterday that it would use the FTTP tech to deliver downstream speeds of up to 300Mbit/s from April 2012. BT separately got clearance from the “relevant authorities” to tweak the broadband signals transmission frequency it uses. The company’s so-called Infinity fibre-to-the-cabinet product will reach theoretical downstream speeds of 80Mbit/s. BT, which has invested £2.5bn on its broadband fibre optic tech that it hopes to roll out to two-thirds of households and businesses by 2015, currently boasts speeds of 40Mbit/s. “All our fibre products are fit for the future and these developments show that to be the case. As always, we want to go further and faster and so our journey doesn’t end here. We can turn up the dial should there be demand and so we can look to the future with confidence,” said BT Openreach boss Liv Garfield. BT added that the six exchanges it plans to have ready for FTTP by the end of this year will boost downstream speeds to 300Mbit/s by next Spring. It claimed the tech was “capable of delivering even more dramatic speeds” of up to 1Gbit/s and added that these were currently being trialled by the firm in Kesgrave, Suffolk. 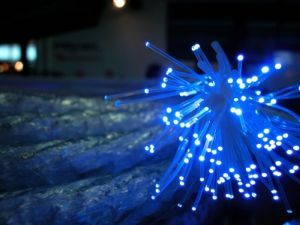 However, arguably BT’s enthusiastic announcements – endorsed by broadband minister Ed Vaizey – were overshadowed by the company having to scale back its ambitions of rolling out FTTP to 12 exchanges by the end of 2012. Meanwhile, the company is set to shortly announce its pole and duct pricing plans. BT is locked in talks with comms regulator Ofcom on this subject. Why has it taken BT & Openreach 7 weeks to provide broadband? Copyright BT Complaints. All rights reserved.